Posted On March 12, 2012 by &filed under Legal Articles. Biological diversity – or biodiversity – is a term we use to describe the variety of life on Earth. It refers to the wide variety of ecosystems and living organisms: animals, plants, their habitats and their genes, it is degree of variation within a given ecosystem, biome or entire planet. Biodiversity is the foundation of life on Earth. It is crucial for the functioning of ecosystems which provide us with products and services without which we couldn’t live. Oxygen, food, fresh water, fertile soil, medicines, shelter, protection from storms and floods, stable climate and recreation – all have their source in nature and healthy ecosystems. But biodiversity gives us much more than this. We depend on it for our security and health; it strongly affects our social relations and gives us freedom and choice. Biodiversity which is the ‘the variability among living organisms from all sources, including terrestrial, marine and other aquatic ecosystems and the ecological complexes of which they are a part and also includes diversity within species, between species and of ecosystems’. Conservation and sustainable use of biodiversity is fundamental to ecologically sustainable development. At the same time, no other feature of the Earth has been so dramatically influenced by man’s activities. By changing biodiversity, we strongly affect human well-being and the well-being of every other living creature. 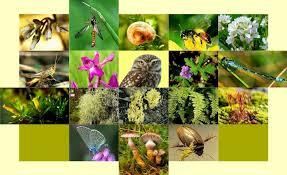 Biodiversity is extremely complex, dynamic and varied like no other feature of the Earth. Its innumerable plants, animals and microbes physically and chemically unite the atmosphere (the mixture of gases around the Earth), geo-sphere (the solid part of the Earth), and hydrosphere (the Earth’s water, ice and water vapour) into one environmental system which makes it possible for millions of species, including people, to exist. The diversity of genes, species and ecosystem is a valuable resource that can be tapped as human needs and demands change, the still more basic reasons for conservation are the moral, cultural and religious values. The importance of biodiversity can be understood, it is not easy to define the value of biodiversity, and very often difficult to estimate it. The value of biodiversity is classified into direct and indirect values. Biodiversity is part of our daily lives and livelihood, and constitutes resources upon which families, communities, nations and future generations depend. Every country has the responsibility to conserve, restore and sustainably use the biological diversity within its jurisdiction. Biological diversity is fundamental to the fulfilment of human needs. An environment rich in biological diversity offers the broadest An environment rich in biological diversity offers the broadest array of options for sustainable economic activity, for sustaining human welfare and for adapting to change. India is one of the 17 “mega diverse” countries and is composed of a diversity of ecological habitats like forests, grasslands, wetlands, coastal and marine ecosystems, and desert ecosystems. Almost 70% of the country has been surveyed and around 45,000 plant species (including fungi and lower plants) and 89,492 animal species have been described, including 59,353 insect species, 2,546 fish species, 240 amphibian species, 460 reptile species, 1,232 bird species and 397 mammal species. Endemism of Indian biodiversity is significant with 4950 species of flowering plants, 16,214 insects, 110 amphibians, 214 reptiles, 69 birds and 38 mammals endemic to the country. India’s contribution to agro-biodiversity has been impressive. India stands seventh in the world as far as the number of species contributed to agriculture and animal husbandry is concerned. In qualitative terms too, the contribution has been significant, as it has contributed such useful animal species as water buffalo and camel and plant species such as rice and sugarcane. India has also been a secondary centre of domestication for animal species such as horse and goat, and such plant species as potato and maize. Biodiversity products have obtained a commercial value and have been increasingly exchanged in the markets having a monetary value, from which their share in the national economy can be judged. In the Indian context it is difficult to put a value on diversity as such because the marketable products are of various kinds both legal and illegal e.g wood and non-wood products from forests where wood comprises the major commercial produce is both legally exported as well as presumed to be illegally smuggled out of the country. The contribution of natural and agricultural biodiversity in terms of crops, live stock, fisheries etc is very substantial in terms of commercial value. Such biodiversity has a major contribution to make to the Indian GDP (gross domestic product). The large economic implications of biodiversity in its wild and domesticated forms is the rice improvement programme. Rice accounts for 22% of the total cropped area and 39% of the total area under cereals, which reflects its importance in the country’s struggle to attain self-sufficiency in food. Loss of biodiversity – the variety of animals, plants, their habitats and their genes – on which so much of human life depends, is one of the world’s most pressing crises. It is estimated that the current species extinction rate is between 1,000 and 10,000 times higher than it would naturally be. The main drivers of this loss are converting natural areas to farming and urban development, introducing invasive alien species, polluting or over-exploiting resources including water and soils and harvesting wild plants and animals at unsustainable levels. Rapid environmental changes typically cause extinctions. One estimate is that less than 1% of the species that have existed on Earth are extinct. Ecosystem stability is also positively related to biodiversity, protecting against disruption by extreme weather or human exploitation. One of the major causes for the loss of biodiversity in India is the expansion of agriculture in previously wild areas. Other impacts include: unplanned development, opening of roads, overgrazing, fire, pollution, introduction and spread of exotics, excessive siltation, dredging and reclamation of water bodies, mining and industrialization. In this century, the Indian cheetah, Lesser Indian rhino, Pink-headed duck, Forest owlet and the Himalayan mountain quail are reported to have become extinct and several other species (39 mammals, 72 birds and 1,336 plants) are identified vulnerable or endangered. Pressure Habitat destruction, overexploitation, pollution, and species introduction are the major causes of biodiversity loss in India. Other factors included fires, which adversely affect regeneration in some cases, and such natural calamities as droughts, diseases, cyclones, and floods, tsunamis etc. Habitat destruction, decimation of species, and the fragmentation of large contiguous populations into isolated, small, and scattered ones has rendered them increasingly vulnerable to inbreeding depression, high infant mortality, and susceptibility to environmental degradation of a chaste city and, in the long run, possibly to extinction. Besides these, the failure to stem this tide of destruction results from an amalgamation of lacunae in economic, policy, institutional, and governance systems. Poor implementation of various environmental legislations including Wildlife (Protection) Act of 1972 as amended in 1991 has lead to a major loss of biological diversity. Unani, Ayurveda and Sidha. Many indigenous medicines also utilize animals and their parts or extracts as remedies for various diseases. Diverse habitats and species also have non-consumptive use-value. Tourism, recreation and scientific research are the major examples. The indirect use-value of biodiversity includes ecosystem process of biological diversity, which provides valuable ecological services to the biosphere; some Poor conviction rates of wildlife cases due to inadequate legal competence in the forest department, and the lackadaisical or apathetic approach of courts with cases pending for years. • Loss of biodiversity has serious economic and social costs for a country. The experience of the past few decades has shown that as industrialization and economic development in the classical sense takes place, patterns of consumption, production and needs, change, straining, altering and even destroying ecosystems. • India, a mega biodiversity country, while following the path of development, has been sensitive to needs of conservation and hence is still rich in biological resources. Ethos of conservation and harmonious living with nature is very much ingrained in the lifestyles of India’s people. If followed diligently can still help in the conservation of biodiversity. • There are innumerable species, the potential of which is not as yet known. It would therefore be prudent to not only conserve the species we already have information about, but also species we have not yet identified and described from economic point of view. Taxus baccata, a tree found in the Sub-Himalayan regions, once believe to be of no value is now considered to be effective in the treatment of certain types of cancer. • Biodiversity is part of our daily lives and livelihood, and constitutes resources upon which families, communities, nations and future generations depend. Every country has the responsibility to conserve, restore and sustainably use the biological diversity within its jurisdiction. Biological diversity is fundamental to the fulfilment of human needs. An environment rich in biological diversity offers the broadest array of options for sustainable economic activity, for sustaining human welfare and for adapting to change. • Low priority for conservation of living natural resources. • Exploitation of living natural resources for monetary gain. • Values and knowledge about the species and ecosystem inadequately known. • Unplanned urbanization and uncontrolled industrialization. Five main threats to biodiversity are commonly recognized in the programmes of work of the environmental conventions: invasive alien species, climate change, nutrient loading and pollution, habitat change, and overexploitation. Unless we successfully mitigate the impacts of these direct drivers of change on biodiversity, they will contribute to the loss of biodiversity components, negatively affect ecosystem integrity and hamper aspirations towards sustainable use. By implementing various environment related legislations including the biological diversity act, 2002, and also by following our ancient wisdom for the conservation of environment, cautiously and diligently we can still protect the rich biodiversity of our country.